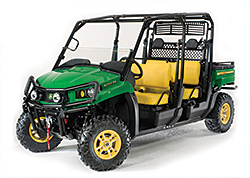 The new Gator™ Mid-Duty XUV 550 and 550 S4 crossover utility vehicles offer off-road performance, improved comfort, cargo versatility, and the ability to transport up to four people. The Gator XUV 550 and 550 S4 provide 9 inches of wheel travel and up to 10.5-inches of ground clearance to smooth out the ride. In addition, for the 550, customers can choose from either standard, high-back bucket seats or bench seats. The 550 S4 comes standard with two rows of bench seats. The 16-hp, 570 cc, air-cooled, v-twin gas engine provides greater speed and horsepower, and the cargo box can carry up to 400 pounds of gear. The 550 also is small enough to fit in the bed of a standard pick-up truck.